Bremen Central Station has hourly connections to Hamburg to the East, Osnabrück/Münster to the South, Oldenburg to the West, and Bremerhaven and the North Frisian Islands to the North. The A1 highway (from Hamburg to Osnabrück) and the A27/A7 highways (Bremerhaven to Hanover) intersect in Bremen. The city is also on the B6 and B75. There are some long-distance bus lines that run to Bremen and operate flexibly within Europe. Buses depart from the central bus station, the ZOB. About 3.5 km south of the city center is the the City Airport Bremen (BRE), a small international airport. Bremen: a regional capital and trading city with a long-standing maritime heritage– a truly cosmopolitan experience. Full of pleasures, Bremen is open to the new and respectful of the old. Bremen delights visitors with its unique maritime attractions and remarkable historic sites- not to mention sensational art and culture. It is a very friendly, cultural and industrial city. With over 1,200 years of history, Bremen flaunts many architectural treasures such as the beautiful Baroque and Renaissance architecture on the market square. This square is home to the Roland statue and Town Hall, both UNESCO World Heritage sites, as well as patrician town houses and the Schütting, Bremen's historical guildhall. Bremen’s world-famous mascots are the town musicians from the popular Brothers Grimm fairy tale. Exciting interactive exhibitions and science centres provide insight into the technologies of tomorrow. Bremen is home to various projects that prove that science is anything but dry and boring. The botanical, the Ethnological Museum and Universum Bremen put the focus on hands-on learning. And at EADS Astrium visitors can find out how astronauts eat, sleep and shower in zero gravity. Not a month goes by without an exciting event taking place in Bremen– from the Freimarkt, Germany's oldest fair, to concerts, plays and art exhibitions, to the traditional Christmas market, whose Schlachte magic stalls extend along the Weser river. Tipp: When in Bremen visit the Schnoor, this part of Bremen used to be the maritim quater and then it´s red-light district. It´s a honey-pot for tourists - small, narrow timber-frame houses from the 15th and 16th centuries with narrow aisles between the rows of the opposite building. Over the years the district transformed into a quaint maze of beautiful restaurants, Goldsmith's, arts and crafts as well as cozy cafes and charming little shops. The name "Schnoor" is north German and means that the houses are strung like pearls on a string. Another interpretation the name leads back that the Taumacher lived in this part of the old fishing quarter. In Bremen, you are never far from nature. Take a trip to the lush, grassy countryside. Enjoy blustery bike rides, walking on tidal flats or exploring peat bogs, the surroundings of Bremen are ideal for a relaxing day out! Sightseers won't even need a map to find their way around. Two thousand nails made of brass and steel guide visitors from the courtyard of the Church of our Lady via the market square to Böttcherstrasse. Once a tradesmen's alley, this narrow lane is now a centre for art and culture. People here appreciate the finer things in life – internationally renowned coffee, chocolate of the highest quality, rare spices, tasty fish specialities and, of course, world-class beers. These can all be found in the city's charming shops, where time seems to have stood still. Creative international cuisine, free public transport and free Wi-Fi are offered at this 5-star service hotel. It offers a quiet location in Bremen city centre, 500 metres from the market place. Set in Bremen’s Bürgerpark, this 5-star hotel offers free Wi-Fi and a 1,200 m² spa area with heated outdoor pool and sauna area. 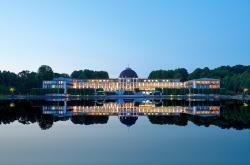 Park Hotel is a 10-minute walk from the Old Town and Bremen Main Train Station. 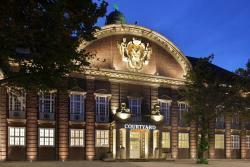 This 4-star hotel is directly beside Bremen Central Station and just 200 metres from the Messe Exhibition Centre. It offers soundproofed rooms, a 24-hour shop, and free fitness facilities.